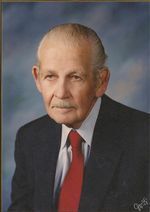 Robert W. Lett, age 94, of Ashland died Friday, June 26, 2009 at his residence. He practiced law and served the community in Ashland County for over six decades. He won an award from the Ohio State Bar Association for practicing law for 67 years. Mr. Lett was born in New York City on June 14, 1915, the son of Harold S. and Georgina (Gerathy) Lett. He lived most of his life in Ashland. He attended Ashland College and graduated from Ohio State University Law School in 1938, with honors of the Order of the Coif. He served in the Commerce Department in Washington, DC in 1940. Later that year he established his law firm in Ashland. It became the partnership of Lett and Lett with his son Sam in 1980. Robert Lett was a general practioner of law, accepting all types of cases for citizens in the community. He served as defense attorney in his last trial by jury at the age of 89. Mr. Lett was a member of St. Edward's Catholic Church, the Elks Club, the Ohio State Bar Association, Ashland County Bar Association, and was elected President of the Ohio Academy of Trial Lawyers in 1962. He was later elected to the Board of Governors of the American Trial Lawyers Association. Mr. Lett was a veteran of the U.S. Army, where he served during World War II from 1941 to 1945. Among other responsibilities, he was the navigator for the lead paratroop plane on D-Day in the Battle of Normandy. He re-opened his law office in Ashland after the war. On October 25, 1947, he married June Eileen (Darling) Lett in St. Edward's Rectory. They had two children, Hashi Cherie Roberts and Sam J. Lett. He was an avid golfer. He established a scholarship in his name for student golfers in the area. He scored a 41 for nine holes at the Ashland Country Club on his 41st birthday. In the 1960s, he donated to the sisters of St. Edward's School his car - a red and yellow Oldsmobile - whose colors had been chosen by his two children. As a high school senior, he competed in English and History competitive exams and finished 1st in English and 3rd in History in the state of Ohio. He had an unceasing and unquenchable zeal for life. He had a life-long love of poetry, fireworks and politics. He was a big time dog-lover and put a commemorative stone in his backyard to bid farewell to his dog Shadrack. To celebrate his 55th birthday and overcome the fear of jumping out of airplanes, he took a short lesson, and parashooted out of a plane and fractured his ankle in three places. He was admitted to practice law before the US Supreme Court. He ran for public office in Ashland, County Public Prosecutor and for Common Pleas Judge. He received the award of Democrat Man of the Year at the age of 91. He is survived by his son Sam J. Lett of Ashland and his daughter Hashi and son-in-law Kanan Roberts of Queens, New York, along with his brother Donald J. Lett of Loudonville. He was preceded in death by his parents, his wife June, and his sister Jean Macdonald. Memorial services will be held at Heyl Funeral Home, at 227 Broad Street, on 7:00pm,Thursday evening, July 2, 2009, with Father James Cassidy officiating. Visiting hours will be held on Wednesday, 2-4 p.m. and on Thursday, 5-7 p.m. at the Funeral Home. Memorial contributions may be donated in his name to the Ashland High School English Department.